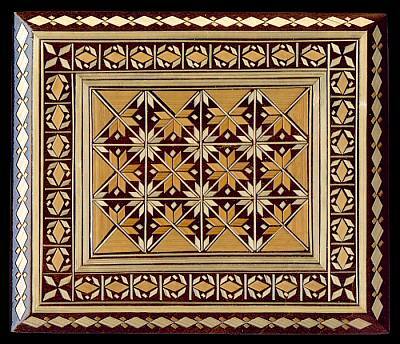 3.88" x 3.25" x 1.75"
This rectangular wooden box features a geometric floral pattern created with straw inlaid into the surface. The straw, in different shades of silvery white, brown and gold, has a glowing quality that contrasts nicely with the dark background. The stain on the outside of the box beneath the straw is darker than the photo suggests. The exterior is covered with a clear lacquer and the inside is plain wood. 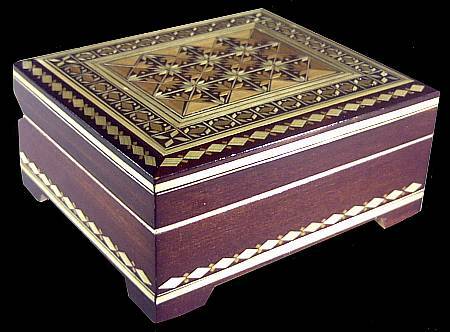 The intricate pattern and fine craftsmanship make these boxes elegant and beautiful decorative accents.